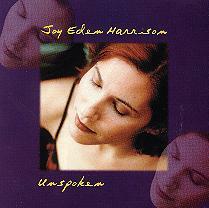 George Graham Reviews Joy Eden Harrison's "Unspoken"
While the pop music scene continues to search for the new fad of the week, there has been growing momentum for the resurrection of all manner of retro styles, everything from rockabilly to acoustic country blues to Sixties psychedelic. One particularly interesting phenomenon has been the revival of swing and other pre-rock genres. Led by the popularity of The Cherry Poppin' Daddies and the Squirrel Nut Zippers, swing seems to be the thing. Not surprisingly, other music from the Swing Era is seeing renewed interest. As part of that, over the past couple of years we have been seeing a fair number of artists who could be described as "chanteuse," or a woman of romantic song, with styles harkening back to performers from Lotte Lenya to Edith Piaf to Billie Holiday even to country diva Patsy Cline. This week we have a really interesting recording by a chanteuse who draws on the romantic torch singers of the past, but creates a recording which is quite new and original. Her name is Joy Eden Harrison, and her new second album is called Unspoken. Joy Eden Harrison brings an interesting background to her music. The only daughter of two visual artists, she grew up in New York's artistic community in a studio loft apartment. Her introduction to live music was hearing avant-garde jazz artists like Archie Shepp and Don Cherry performing at her parents' place in peace benefit concerts. Her family background also includes a great aunt who was a famous Hollywood screenwriter of the 1920s, and a great uncle, Milton Ager, who was one of the significant composers of Tim Pan Alley, writing such classics a Happy Days Are Here Again. Ms. Harrison migrated to the West Coast to study jazz guitar at the Musicians' Institute in Hollywood. After graduating, she moved to Europe and played on the streets while earning a living as a painters' model. A German promoter took a liking to her music and booked her on a tour which gained a fair amount of critical praise on the Continent. She returned to Southern California and settled in the San Diego area where she eventually landed a contract with Bizarre/Planet Records, which in an earlier day had been Frank Zappa's label. They released her debut CD Angel Town. Now she is out with Unspoken on the independent Chicago-based Astarte Records. The CD was produced by Cindy Lee Berryhill, a singer-songwriter in her own right, known for her clever and sometimes irreverent songs. But Ms. Berryhill assembled a fascinating musical setting for this CD -- a small string section and essentially a jazz trio, providing for accompaniment that can match the romanticism of the songs, but there is also occasionally an odd spacey synthesizer which provides a curious juxtaposition. Ms Harrison herself has a voice that perfectly fits the mood, often assuming some of the inflections and mannerism of Billie Holiday, while maintaining an interesting balance between sensuousness and a kind of detached aloofness. Her lyrics often have a darker quality, and even when the subject is love, there is an undercurrent of the bittersweet. Stylistically, the album ranges from lushly romantic to spacey atmospherics to a kind of 1950s-style jazz beat poem. Her group includes pianist John Erickson, drummer Jeff Dalrymple and bassist Chris Davies. The CD does not credit anyone as arranger, but the orchestrations are one of the most fascinating and appealing facets of Unspoken. Joy Eden Harrison's new second album Unspoken is a downright fascinating record which starts with hints of romantic torch songs of the past but goes in a lot of interesting and unanticipated directions, from the string section that sometimes sounds like a classical chamber group, to the spacey synthesizers, to lyrics that often take you by surprise with their curious turns. Ms. Harrison's vocals are both seductive and occasionally bittersweet, and her songwriting quite creative both musically and lyrically. It's a beguiling album that soon draws one in, proving to be much more than it seems at first. The album's arrangements are especially brilliant, with skillful and tasteful string orchestrations and very creative mixtures of sounds. The arranger was sadly not credited on this CD, though it might well have been either Ms. Harrison herself or producer Cindy Lee Berryhill, who as producer did a stellar job. The only quibble I would have is the use of an electric bass or a bass synthesizer instead of a real acoustic bass on the jazzier tracks. From a sonic standpoint, we'll give the CD a B+. Most of the recording has good clarity and the occasional studio effects are tastefully done, but there's more audio compression than there needs to be, and a bit of distortion can be heard especially on the closing, solo track The Innocence Begins Again. Joy Eden Harrison's new CD is one that is pleasingly hard to categorize, and proves to be one of those records that will grow on one with each successive hearing. It's impressive in writing, performance and production.